A 404 error just means "Hey, I can't find the webpage! ", just like when you lose your keys. When you ask a web server for a website, it lets you know how everything went. This status update is called an HTTP status code – 404 is the status code for “website not found.” There are about 50 different possible HTTP Status codes and they’re all laid out in boring-sounding Internet standards documents. 200 OK is for when everything worked out. The web server finds the page and sends it on over to your computer along with the 200 OK, no questions asked. You don’t ever see 200 OK, you just see the website you were looking for! and your browser would mosey on over to the new location. Again, you won’t ever see that one! 403 Forbidden is a pretty fun one because you only get that one if you’re clearly trying to break some rules. If I ask you to buy me lunch tomorrow – a perfectly acceptable request – you can say 403 Forbidden! and shut me down. But I’ll be so hungry! 400 Bad Request would come up if I asked you to buy me a fSF4kjnw tomorrow. Since it’s nothing but nonsense, the web server can only look at you sideways and say What?. 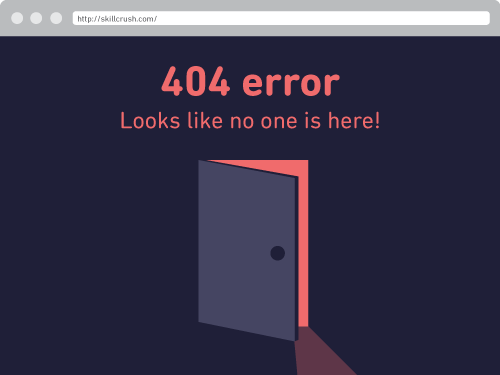 Usually you will only see a 400 error if there is something wrong with your browser, or you followed a really broken link. 500 Internal Server Error is one you’ll get used to if you embark on becoming a programmer for the web. It’s the web server crying out for some help, because something’s broken in the code. It isn’t your fault, though, don’t worry. So, those are the greatest hits of HTTP status codes. 418 I’m a Teapot was put together as an April Fools Day joke in 1998, as part of the specification for the Hyper Text Coffee Pot Control Protocol – meaning status codes for your teapot! I promise it’s true! If skillcrush.com were a teapot it’d definitely be able to use that code, but since we are just a website, not so much!